This beautiful gold and red bracelet has two strands, one made of Swarovski crystal bicones in two shades of Sian separated with a hint of gold bead. 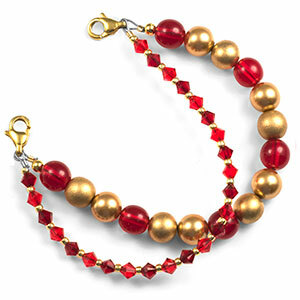 The second strand made of Czech ruby red glass beads, Swarovski crystal shiny gold pearls and Swarovski crystal satin gold pearls. Clasps are 316L stainless steel. 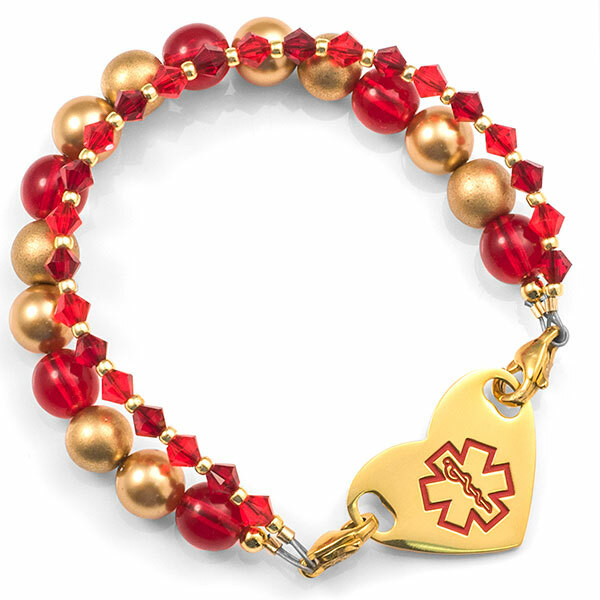 Bracelet measures 5-7 inches in length and attaches to any engravable plaque you see on this page. Remember to add the bead length to the plaque length to achieve total length of bracelet. Plaque not included - please order separately. This unique bracelet has been made for you by a member of our StickyJ creative design team. You can be assured that it is one of a kind, and cannot be found elsewhere!